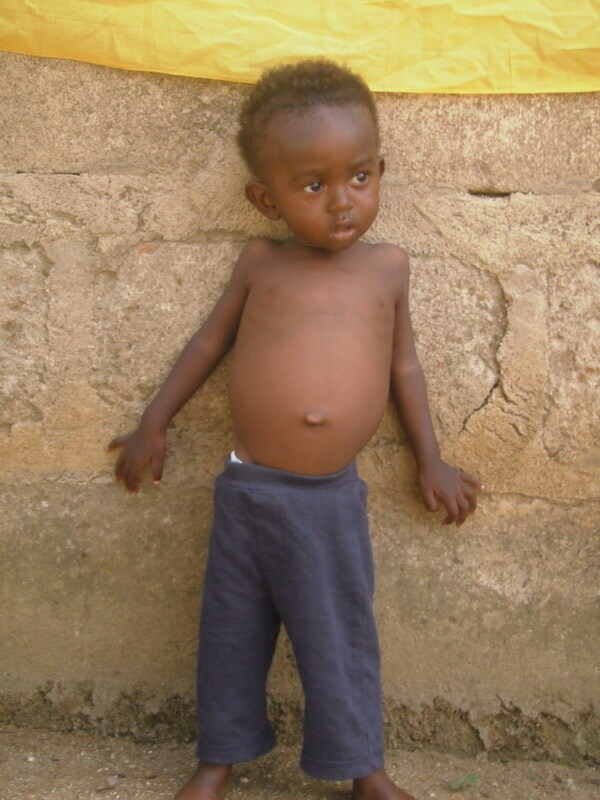 Little Boy on Refugee Camp needs help! Silas Davis is 2 yrs. old but weighs only 6 kgs. Today one of our leaders took him to a hospital in Accra. 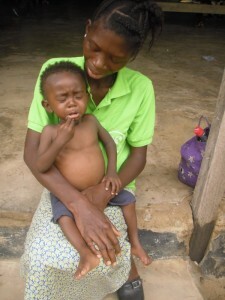 He needs proper nutrition, but how will he get that if Mama has no money? The question is always the same….. who will help? Today the Doctor gave Silas the drugs he needed, but said he lacked certain vitamins and other nutrients which would help him thrive. Maybe Mulbah is one of our single mothers on the refugee camp. Life has been hard for her since the civil war in Liberia. MAYBE MULBAH’s story is very sad like so many others on the camp. This is her story as she told it to Bernice Williams today. “In 1996 rebels enter my home and torture my family and I, they put us out of our house, beating us naked,and set our house on fire ,then took my father away. We manage our way to escape through bushes and came to Ghana. My poor mother is disable and in wheel chair we struggle to get her with us to Ghana through the gun shoot. By the help of God we arrive in Ghana safely,except our father who the rebels took away. They must have kill him because we have not seen him up to present. While in Ghana I go washing clothes for people in the camp just to try to feed my family, I have two children and the father has abandon me and them. Maybe lives in very poor conditions. On the Buduburam Refugee Camp there is no UN help. They have stopped helping. Liberia is considered a safe country, and the refugees are asked to go home. HOW WILL THEY GO HOME, THEY HAVE NO MONEY? A few years ago the UN provided free transportation to fly home, if you were a registered refugee. They no longer provide that. We have already helped many get back home. It costs only 200 USD per person to travel back on land, but when you get home, what then? There is no place to live and no job. 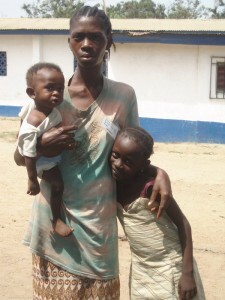 Unemployment is still at an all time high in Liberia, and the people there are just as poor. They need our help. How? By helping them resettle, then providing a micro loan for them to make their own living. I hope I am not sounding too harsh, but I know how little it takes to feed a family on the camp. If this family could get 75 dollars a month they would make it. Rice is 60 GHc per bag now, and honestly I don’t know how these people survive without help. They buy their drinking water AND their bath water. I am glad that Maybe is part of our Single Mothers Program, and comes out regularly to our prayer group. She is wearing one of the T-shirts, we purchased for the last conference. I don’t normally purchase T-shirts but this one time, I wanted to. They have so little. Thank you to all who helped for this. We had enough to feed all the guests! I hope you hear my heart, I have heard so many people ask me “how do we know the funds will get to them?” Trust me, I know the funds get to them!!!! I go there, and see for myself. I correspond with our leaders every day. I know them well.